Everyone else has a web site these days, so I figured, why not me, too? I hope you like my website. I love stories and poems so I plan on putting new ones up every month. If you have any comments please write to me at my e-mail address at the bottom of this page. I hope to update this page often with stories and poems. Please be sure to send me your poems and stories at my e-mail address and I might put them up too. Please include your name so I that I know who's work it is. 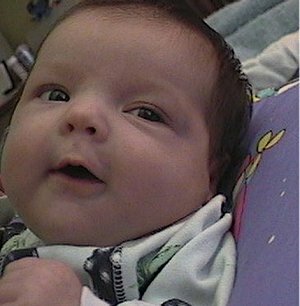 The picture below is of my baby sister, Lydia. Isn't she adorable? Author and lecturer Leo Buscaglia once talked about a contest he was asked to judge. The purpose of the contest was to find the most caring child. The winner was a four-year-old child whose next-door neighbor was an elderly gentleman who had recently lost his wife. Upon seeing the man cry, the little boy went into the old gentleman's yard, climbed onto his lap and just sat there. When his mother asked him what he said to the neighbor, the little boy said, "Nothing, I just helped him cry."